Hello, just a quick post from me to keep me amused travelling back the long slog from London to Pembrokeshire after Brit Mums. I was too unorganised to write a pre- Brit Mums “I’m going to Brit Mums” or “What I’m wearing to Brit Mums” post, so I will attempt an outfit one now- better late than never. I always remember the Golden Rule when packing light for a trip away is to bring all coordinated pieces (everything must match). The other rules for me (as I backpack on the Megabus) are the clothes have to also be both comfortable and crease free! Therefore leggings and jersey dresses are usually a win. so everything else I packed had to match around that-the jewellery, handbag, shoes and hair accessories. The colour navy on it’s own feels a bit too sensible for me so I chose to add red to perk it up a little. 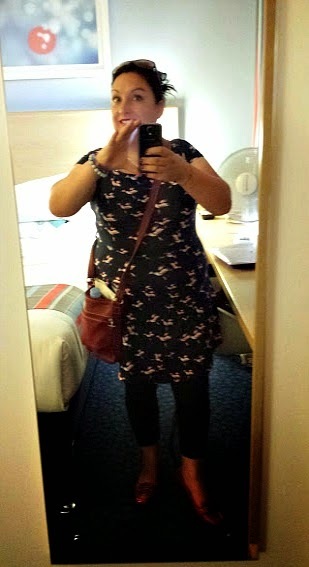 I wore the same Clarks Shoes and the same Mia Tui Lottie Claret Handbag with all my dresses. 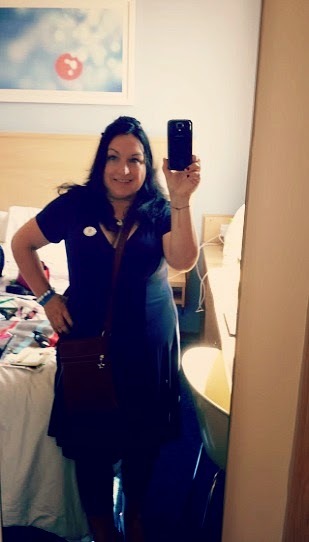 I really do love this fit and flare dress and the sweetheart neckline and three quarter length sleeves meant I did feel quite cool in the heat wearing it but I admit if I was slim then a teeny Summer dress would have been my oufit of choice, heck I would probably have just donned a bikini- it was so hot! 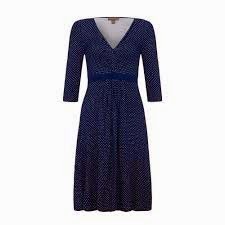 I loved the vintage feel that the polka dot print gave and the jersey material makes it a a flattering, wearable dress that I will get a lot of use out of. I felt comfortable wearing it for the long day at Brit Mums- Fever in the morning and Fever all through the night! On the Friday night I wore a Navy New Look Hummingbird Bardot Skater Dress from ASOS. I loved the shape of this dress although it was more fitted and revealing than I normally feel comfortable wearing. I adore the pink hummingbird print…I did try and buy a pink flamingo print dress recently but sadly it was out of stock. I also packed a Navy Cardigan to wear over all the dresses but in this Summer heat I had no need for it! On Sunday for the long journey home I wore a Navy ASOS Skater Dress with buttons down the front giving it a casual Shirt Style that I like. I may well buy this dress in more colours as it is very versatile. I will layer it up and still get use of it during the colder seasons. 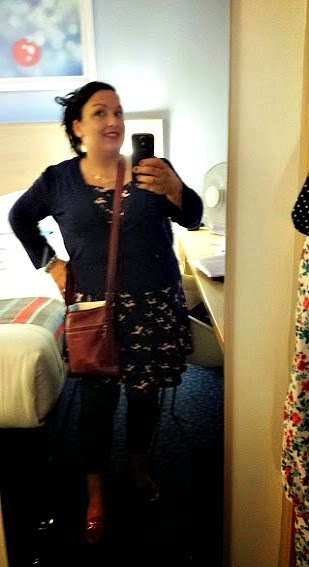 These photos of me are just my quick “send a photo to my sister to check I look OK enough to leave the hotel room” photos, so I do apologise for the colour and quality! 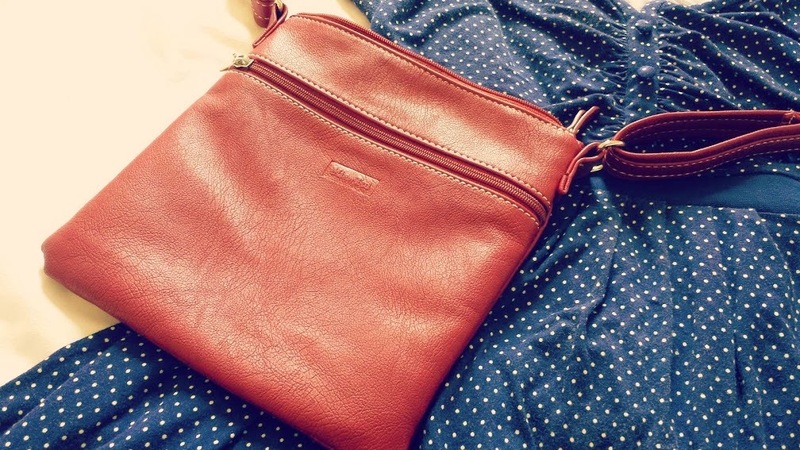 My beloved everyday hand bag is my Mia Tui Matilda Mae in Aubergine. 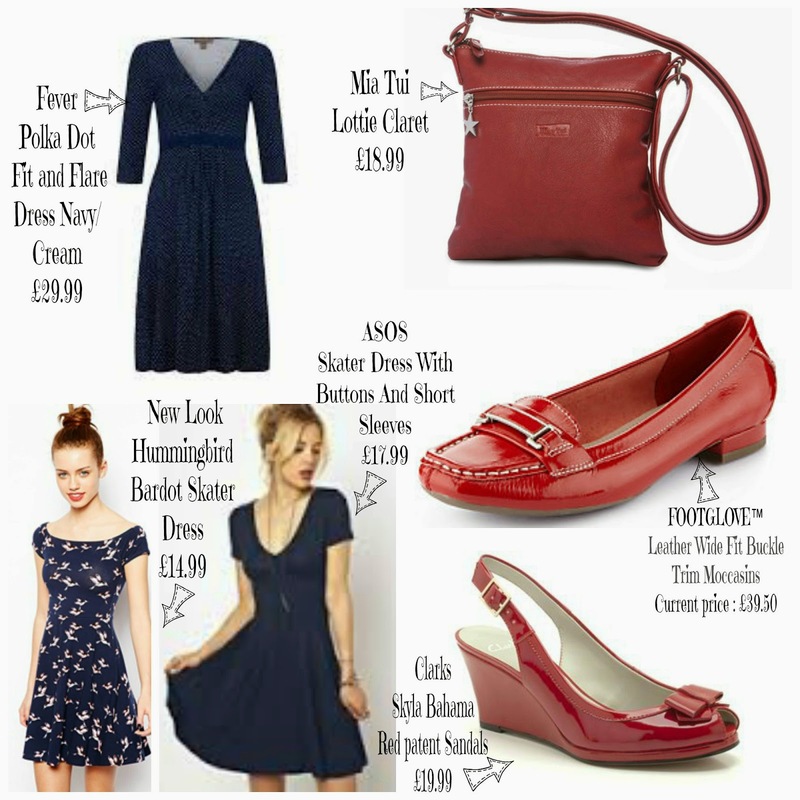 To go with these navy dresses I bought the smaller Mia Tui Lottie in Claret Handbag to wear to Brit Mums. 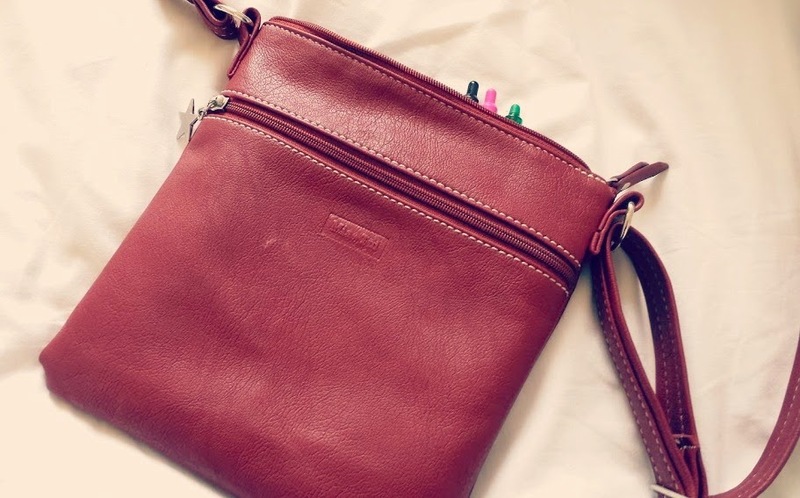 It worked great- big enough to hold a tablet, notebook and bottle of water, plus my phone and small purse, but not too bulky making it not look out of place at the evening socials. I wanted to only bring one pair of red shoes but realised that I would also need a flat pair for walking (miles and miles!) around the streets of London as well as wedge heels so I could reach the mic on Saturday! 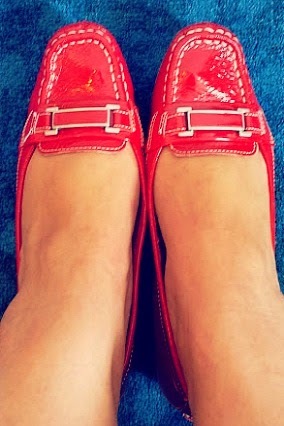 So I also packed a pair of red patent moccasins from Marks and Spencers. These are the heels which I wore for the Keynote Bloggers Reading. 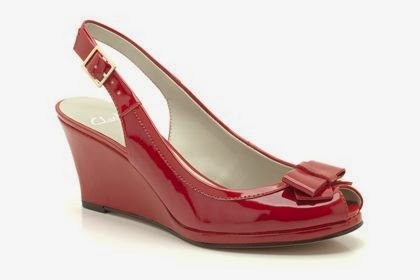 I find wedge shoes more easy to walk in than regular high heels. Unfortunately, both pairs of shoes did rub the backs of my heels so I am wearing flip flops for a week to recover! I hope that they will feel comfy again once the blisters have heeled. This is my fault though for wearing new shoes for a lot of walking and standing instead of breaking them in gradually. I planned to wear a red heart tattoo style necklace but in the end went for a trio of hearts necklace from People Tree. I packed navy and red hair accessories. In this heat the quickest hairstyle is a quick bun which I dress up with a red rose garland bobble. 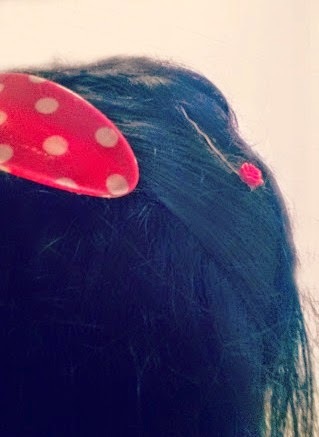 I also love red rose clips and my Red Polka Dot Hair Clip- I wear this for “half up” hair do’s but I may try it with a twist and up or a side pony tail this week- if the clip is strong enough for my thick hair…we will see! 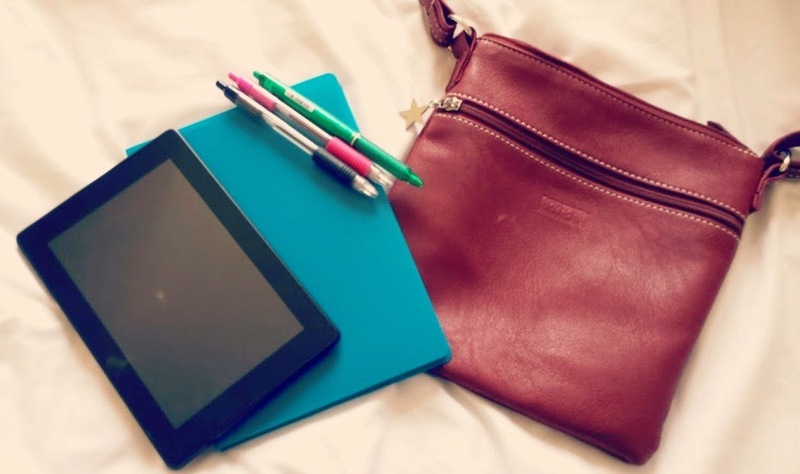 I’m hoping to write more about Brit Mums this week but as always (as well as being a fun fabulous weekend!) it was also emotional and mentally exhausting so I’m still taking the time to think about it at the moment and let it all sink in!